Alas, Poor Labour. Bye-election results: Copeland gone. That's Corbyn's fault. Nuttall kicked in the nuts. That's nothing to do with Corbyn. It is true that the media does not give Corbyn a fair hearing. But it is also true that he is a poor performer on the media. His delivery lacks sparkle, to say the least. His media strategy is to deliver a list (the longer the better) of problems that need fixing. 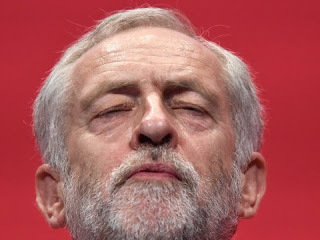 He fails to give a direct answer when asked if he actually wants to be PM - to the point that we may wonder if he believes in the Parliamentary road to socialism at all. Then there is his lack of clarity on PR, and his rejection of the Progressive Alliance. What does all this mean for the Green Party? We need to learn from Labour's failure to communicate. We have to move beyond just listing Tory failings, beyond listing the nice, apple-pie things that we would do, and we need to be setting out, carefully, methodically and progressively, the precise way that we would improve things. The number one question that Corbyn and Greens face is this: "How would you pay for your programme? Borrow?" We need to answer this question step-wise. First step is to establish the principle of *investment*: putting money into the system today, in the reasonable expectation of getting more money back in the future as a result. We can talk about the jobs-rich nature of the Green economy, showing how a full employment economy is a more equal economy, which means a more healthy society. These points needs to be iterated and reiterated until the interviewer says "We know you want to invest in good work, we understand that, but how are you going to get the money to actually do it?" We then move towards talking about closing tax havens and tax loopholes. And so on. We present a coherent, systematic case showing how we make the transition from the present mess to an equitable, sustainable economy and society. Leave Labour to its wallowing. Our task is to get on with constructing and communicating the plan for healing our human and natural world. Can we add "learn how to tap into political discontent and anger" to the list? I don't understand why we let UKIP and Theresa May pose as the anti-establishment party. If you want to see how a progressive party does this, look at how the SNP tapped into anti-Westminster feeling North of the border. Hi Rangjan, yes, it is extraordinary how suddenly Trump is the Voice of the Oppressed Masses. It's true that Trump taps into popular anger, although May doesn't. I suppose the Green Party has always aspired to tap into Popular Reasonableness, but it doesn't seem to work too well. I suppose we need more dosh really. Or something.